Hello and welcome to the 420th installment of the SWD. If you would like to support Syrian War Daily, please consider whitelisting or turning off your ad blocking software on the website. For a second day in a row, fifth and sixth batches of evacuated rebel elements and their families from Yalda, Babbila, and Beit Sahem, as well as the second batch of evacuated rebel elements and their families from the Northern Homs pocket, are still waiting for Turkish approval in the vicinity of Abu al-Zindeen crossing near the city of Al-Bab, in order to enter the rebel-held areas of northern Aleppo. However, the second batch of evacuated rebel elements and their families from the Northern Homs pocket left Abu al-Zindeen crossing and entered Idlib through Qalaat al-Madiq crossing in northwestern Hama. The batch was accommodated in Saed camp in Idlib and in Meznaz camp in western Aleppo. Four elements of the Islamic State escaped from a Free Syrian Army’s prison in the village of Shamarakh, north of Aleppo. The elements attacked a guard while he was giving them food, stole his keys, shot another guard, seized a vehicle and fled in unknown direction. 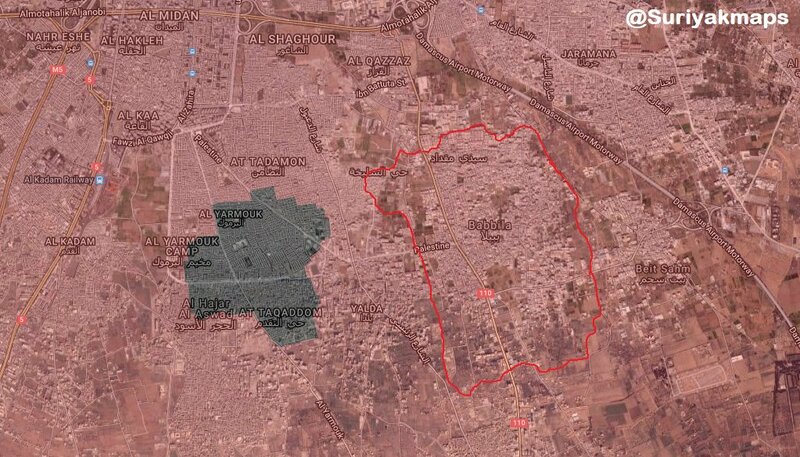 The prison was reportedly controlled by the Free Syrian Army’s Military Council of Tell Rifaat. Left over Islamic State’s improvised explosive device killed a civilian in the village of Al-Fakhikhiyah, west of Raqqa. Syrian Democratic Forces reportedly captured two elements of the rebel “guerrilla” group Harakat al-Qiyam in the governorate. Hayat Tahrir al-Sham reportedly arrested a sleeper cell in the city of Idlib, consisting of three women. The sleeper cell operated in the western parts of Idlib city. Hayat Tahrir al-Sham’s Ibaa News Agency claimed that the cell has connections with Russia and regularly communicated with Hmeimim Air Base in Latakia. The agency also stated that the cell conducted several attacks with improvised explosive devices, and planned to carry out assassinations. Improvised explosive device targeted a vehicle of Jaysh al-Ahrar on the road between Kafr Nabl (Kafranbel) and Kanafra. Two elements of Jaysh al-Ahrar were wounded by the explosion. Turkish Armed Forces’ delegation went from Morek area to Al-Ghab Plain, inspecting areas for the future establishment of an observation point in the region. Improvised explosive device targeted a vehicle of Jabhat Tahrir Suriya on a road in the village of Qalaat Karakat in Jabal Shahshabo area. The explosion wounded four elements of Jabhat Tahrir Suriya who were in the vehicle, and two civilians who were present in the area at the time of explosion. The same road was used by the Turkish Armed Forces’ delegation earlier in the day. Negotiations Committee of the Northern Homs announced the temporary suspension of future batches of rebel elements and their families started evacuating from the pocket. The committee stated that the suspension will last till the two previous batches from the pocket are secured. Russia reportedly agreed to and confirmed the temporary suspension of evacuations from the pocket. At 3:00 AM Syrian time, another massive round of Israeli cruise missiles struck the 10th Division base, 4th Division base, the Republican Guard command base in Qasioun, military bases in Kiswah, and Douma. Syrian Army artillery responded by shelling Israeli positions in the Golan Heights. There are also reports that Syrian air defenses downed an Israeli cruise missile over Homs province. The exchange is still ongoing. No casualties have been reported so far. Syrian Arab Armed Forces’ General Command stated that Syrian Air Defense destroyed a large part of the missiles launched by the Israel Defense Forces last night. Reports claim that at least 23 elements of the Syrian Arab Army and allied militias were killed by the targeting of the Israel Defense Forces. The last seventh batch of rebel elements and their families started evacuating from Yalda, Babbila, and Beit Sahem south of Damascus, towards northern Syria. Syrian Arab News Agency stated that 37 buses carrying fighters and civilians left the aforementioned localities towards northern Syria. Syrian Arab News Agency also stated that the Syrian Internal Security Forces will enter Yalda, Babbila, and Beit Sahem, after the remaining rebels and their families evacuate from the localities. Islamic State’s Amaq Agency claimed that around 20 elements of the Syrian Arab Army were killed during clashes in Al-Hajar al-Aswad and Al-Yarmouk camp, south of Damascus. The agency also stated that the Islamic State downed a Syrian Arab Army’s reconnaissance drone and damaged a tank in the same areas. Islamic State’s Amaq Agency stated that four elements of the Iraqi Army were killed and two wounded, during clashes between the two sides in Al-Tabi area of Al-Tarmiyah. Iraqi Security Forces captured five senior Islamic State’s commanders/figures, as they entered Iraq from Syria. Four of the five captured figures that were captured are; Saddam al-Jamal (Islamic State’s leader/emir of Deir al-Zour region), Mohammed al-Qadeer, Issam al-Zawbaie, and Omar al-Karbouli. Islamic State’s Ismail al-Ithawi, who was captured in Turkey and extradited to Iraq, lured the figures to cross from Syria to Iraq. Afghan National Security Forces conducted large-scale operations in Bilchiragh district against the Islamic Emirate of Afghanistan (Taliban), reportedly recovering most of the district. Afghan National Security Forces killed 22 and wounded seven elements of the Islamic Emirate of Afghanistan in the district, according to the Afghan Ministry of Defense. Afghan National Security Forces killed 19 and arrested four elements of the Islamic Emirate of Afghanistan, as well as destroyed several weapons depots and ammunition caches in Pashtun Kot district. Islamic Emirate of Afghanistan overran three Afghan National Security Forces’ checkpoints in Quraish area of Dawlat Abad district. After capturing the three checkpoints, the Islamic Emirate of Afghanistan also captured Quraish area, which is inhabited by around 1000 families. Afghan National Security Forces killed nine and wounded six elements of the Islamic Emirate of Afghanistan in Tishkan district. Afghan National Security Forces started an operation to recapture Tala wa Barfak district, a day after the Islamic Emirate of Afghanistan captured the district. Afghan Ministry of Defense stated that the Afghan National Security Forces killed 17 and wounded 24 elements of the Islamic Emirate of Afghanistan, as well as destroyed a weapons depot and three vehicles in Tala wa Barfak district. Islamic Emirate of Afghanistan killed six and wounded 13 elements of the Afghan Local Police in Bati Kot and Dur Baba districts. Nine elements of the Afghan National Army surrendered to the Islamic Emirate of Afghanistan in Khogyani and Hisarak districts. Afghan National Security Forces killed four and wounded one element of the Islamic Emirate of Afghanistan in Nirkh district. Islamic Emirate of Afghanistan’s Al-Emarah News claimed that United States’ warplanes mistakenly targeted Afghan National Army’s Mehdi Ghoundi checkpoint in Nirkh district and destroyed it, as well as killed 11 and wounded one soldier. Islamic Emirate of Afghanistan’s improvised explosive device destroyed an Afghan National Army’s armored vehicle in Saydabad district. Afghan National Security Forces killed four elements of the Islamic Emirate of Afghanistan in the province. Residents of Kharaak area in Qadis district pledged their allegiance to the Islamic Emirate of Afghanistan. The aforementioned area contains more than 22 villages and 2500 families, under the leadership of five commanders; Qutub-ul-din Khan, Ghulam Farooq, Mula Abdul Ghafor, Abdussalam and Nooruddin. Besides the five aforementioned commanders, additional 130 elements of the Afghan National Police and Afghan Local Police present in the area defected to the Islamic Emirate of Afghanistan. Afghan National Security Forces killed five and wounded eight elements of the Islamic Emirate of Afghanistan in Giro district. Islamic Emirate of Afghanistan killed six and wounded three elements of the Afghan National Army in Giro district. Islamic Emirate of Afghanistan’s Al-Emarah News stated that more than 18 elements of the Afghan National Army were killed and another 25 wounded, during five-day clashes between the two sides, as the latter attempted to reopen the road from Andar district towards Paktika Province. Al-Emarah News also stated that six armored vehicles were destroyed during the same clashes. Afghan National Security Forces killed 37 and wounded four elements of the Haqqani network in the province, according to the Afghan Ministry of Defense. Afghan National Security Forces killed eight and wounded five elements of the Islamic Emirate of Afghanistan, as well as destroyed two bases and several weapons depots and ammunition caches in Chora and Deh Rawud districts. Afghan National Security Forces killed an element of the Islamic Emirate of Afghanistan in Shinkay district. Islamic Emirate of Afghanistan overran three Afghan National Security Forces’ checkpoints in Poti area of Arghandab district. Afghan National Security Forces killed 29 and wounded five elements of the Islamic Emirate of Afghanistan, as well as destroyed five motorcycles in Khash Rod district, according to the Afghan Ministry of Defense. Islamic Emirate of Afghanistan overran an Afghan National Army’s checkpoint in Kotalak area of Delaram district, reportedly killing and wounding more than 15 elements in the process. Afghan Air Force targeted the checkpoint after the Islamic Emirate of Afghanistan overran it, killing two and wounding three elements of the group, as well as destroying three motorcycles. Islamic Emirate of Afghanistan attacked Afghan National Security Forces’ positions in Mateki and Nissar Ahmad Charrahi areas of Nad Ali district, reportedly destroying two armored personnel carriers, as well as killing and wounding seven elements in the process. Afghan National Security Forces killed 13 and wounded 23 elements of the Islamic Emirate of Afghanistan in Maywand and Khakrez districts. Islamic Emirate of Afghanistan killed nine elements of the Afghan National Army and destroyed a vehicle in an attack in Darwashan area of Khakrez district. Separately, two Islamic Emirate of Afghanistan’s improvised explosive devices destroyed an Afghan National Army’s armored personnel carrier and a pickup in Sangbar and Kalancheki areas of Maywand district. Islamic Emirate of Afghanistan ambushed a group of Afghan National Army’s elements in Badi Karez area of Shorabak district. Seven elements of the Afghan National Army were killed, while one element of the Islamic Emirate of Afghanistan was killed and four wounded in the encounter. CJTF-OIR announced a change in their publishing policy. Now two strikes reports will be published each week, on Mondays and Fridays. Intellectual credited property used may vary from an edition to edition. Feel free to voice your opinion in the comments section below, constructive criticism is welcomed. Syrian War Daily is looking for individuals willing to contribute to the project. If you are interested in contributing, please fill out the form on this page. For those of you interested, you can follow us on an official Twitter account @SyrianWarDaily, or me personally on my twitter @joskobaric where I occasionally tweet some things.